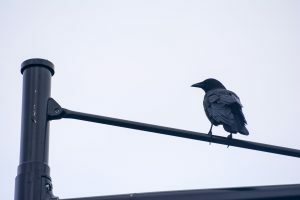 The Canadian Wildlife Health Cooperative (CWHC), Atlantic Region, and Regional Diagnostic Virology Services at the Atlantic Veterinary College, University of Prince Edward Island, have diagnosed West Nile virus (WNV) in three wild crows from PEI. These crows were found dead by a member of the public in September, 2018, in Cornwall, PEI, and submitted to the CWHC Atlantic lab for testing. Necropsies were performed on all three birds, and necropsy results suggested WNV. Testing performed at AVC Regional Diagnostic Virology Services confirmed that the crows were infected with WNV. Samples were also submitted to the National Microbiology Laboratory (Public Health Agency of Canada) in Winnipeg for further confirmatory testing. The life cycle of WNV involves mosquitoes and several species of wild birds: WNV is carried and transmitted to birds by infected mosquitoes. The virus multiplies in the bird and enters the blood, where it may be picked up by mosquito bite and transmitted to a new host. WNV can cause significant disease and mortality in crows, ravens, and jays, as well as several other bird species. The virus can also cause disease in many wildlife and domestic animal species, especially horses. Infected wild birds may be lethargic or exhibit unusual behaviour, or they may simply be found dead. The virus is not directly contagious between people or animals, but can be transmitted through blood-to-blood contact. If handling dead birds or other wildlife, it is always recommended to wear gloves and use good hygiene to protect against disease. Protection against mosquito bites is the best way to prevent the disease in people. If members of the public find dead crows, ravens, or blue jays, they are asked to contact the CWHC Atlantic Office at AVC to coordinate submission for WNV testing.